A bunch of Disney Legends. Who: Me, Keane. The person who actually writes this drivel. PiC, Partner in Crime. Travelling companion and hanger on. BYPT Jenny. A substitute PiC, only shorter. 1) Much of what is here is fact, mostly fact, or complete figments of my imagination remembered as fact. That's my story and I'm stickin' to it. 2) Yeah, this is mostly innuendo and sarcasm. Anything else is a bonus. 3) If you take something in this report seriously and get offended, I will laugh at you. I am not Disney. You will not get free park tickets, food, fastpasses or guest assistance cards. 4) Please remember to take all your personal belongings, and have a magical Disney Day! Really nice day. Reality, last day. But it's going to be a *great* day. Make coffee, and we sit on the balcony and gawk...well, I think you get the idea by now...and have a cup. Even though it rained last night, it's a Beautiful Morning. Off in the distance to the left, you can see ExE, but Spaceship Earth must be on the other side of the hotel. It's the start of the day for Disney as well, you can see the monorails and trains being switched into the system from the maintenance facility up North. A ship sounds it's horn to wake up the guys in port that a ship is arriving. Someone has woken up the express monorail that they park overnight in the Contemporary, and the subtle vibration of the Monorail as it passes through the lobby below us can be felt. The busses are running to bring guests doing character breakfasts to the contemp and to MK. Magic is being made. How geeky that sounds. Jenny was cold yesterday, so she wants to borrow my "Great American Classic" Mickey sweatshirt. I brought it 'cause I had the room in my roller duffel, but was hoping not to have to use it. I don't care if she uses it, so long as *I* don't have to use it. On the other hand, it's supposed to be cool today. Upper 80's. Intense sun. But still cooler than it has been all week. There is an Ironman here today, and World Drive is closed. I don't care. I'm already here. We go down to the convention center, this time getting off on the fourth floor, then the escalator down to the second floor, which leads to the bridge to the convention center and then escalator down to the convention center. I soon have Jenny asking if this is the floor we really want. We are a little earlier than yesterday, but the line is no shorter. If anything, it's longer than yesterday, we're just a little further up in it. Jenny does point out all the other women in Sweatshirts and warmer clothing. All the guys are in t-shirts and shorts. So it's a gender thing. The day opens with Steve Clark (head of D23) doing "The Wonderful World of Walt Disney World Ephemera", a 723 slide slideshow, featuring 40 years of Park Maps, Times Guides, Paper Napkins and Coffee stirrers.... Right. The first real session of the morning is "Walt Disney World in Detail", hosted by Jason Surrell, Joe Grant and John Hench. These are the guys that put the detail into we see into the parks, and are proud to show it to you. They obviously work together and know each other. Think Moe, Larry and Curly. It is probably best to walk through the pictures, any needed explanations will be in text below the picture. The next session "Imagineering Walt Disney World: From Yesteryear to Tomorrowland", was less about yesteryear, and more about previews of Star Tours 2, The Art of Animation resort and the MK Fantasyland expansion. Also announced, was the return of the original Tiki room when the refurb due to the fire is complete. During the lunch break, we decided to make good on a decision that was supposed to be done yesterday for dinner, a trip into MK and the Columbia Harbor House. I had the fish and chips (the Fish and Chips in the UK is marginally better, due to the larger fish pieces, but sitting inside Columbia Harbor House was way better than in the heat of the outdoors in the UK. ), Jenny had the hummus sandwich. We are sitting over the walkway between Liberty Square and Fantasyland, overlooking the queue to Haunted Mansion. 'Tis an excellent place to people watch, especially when the guests below have no clue they're being watched. The plan was to do Haunted Mansion after lunch. But the line starts to grow, and at one point the line backs into Liberty Square. The queue is at one time up to 20 minutes, and I think they meant it. But by the time we're done with lunch, the queue length shortens up, but still pretty long. Then we find we can take the right queue, and are in the pre-show within a couple minutes. Show queue hint: If you want to play with the new stuff in the queue, take the left queue. The right queue will bypass the new stuff, and put you directly into the pre-show. "When hinges creak in door less chambers..."
Our final ghost rips off Jenny's head and replaces his own with hers, then takes a bow. Amazing. We're out of time. An interesting optical illusion occurs in Liberty Square on our way out. The scaled buildings may make a smaller building look larger, but it also makes the Contemporary hotel look closer than it really is. We monorail back to the Contemporary. Both afternoons sessions were by the Disney legends. One was called "Creating 'A Whole New Disney World'", and the other called "Making the Magic Happen". 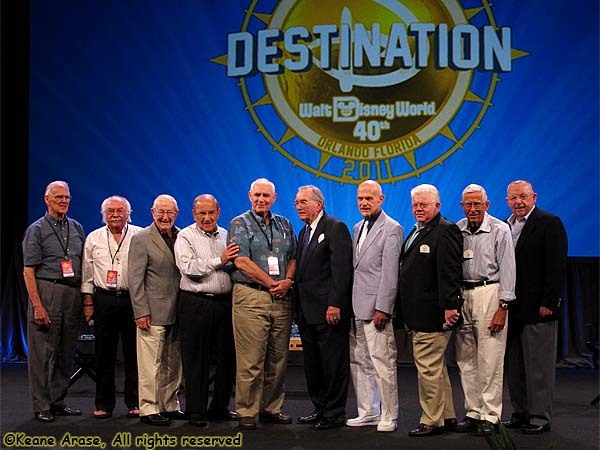 The former panel are the guys of legend, the guys that actually acquired the land and prepared to turn it into Magic Kingdom and EPCOT, the second are the guys who subsequently inherited Walt Disney World after Walt's death. These were the guys who opened and operated the park for the first 10 years. I do have a suggestion. Forget the trite questions like, "What do you think Walt would think of WDW today..." Do you really expect any of them to say, "He would have been disappointed that his dreams weren't seen to their logical conclusion"? After all, he was planning Epcot until is dying day. You don't have to be stupid to think Walt didn't think it wouldn't be built. With these panels, it's far more interesting to hear about having to fly in 200 cases of Coors on the company plane, because you couldn't get Coors out here. The story about the guy who ran what we'd call today a convenience store, the only store for miles, who quickly found out that the Disney Employees got paid on a Thursday, and 400 cases of beer sells out in a couple of hours. We want to hear the guy from WED (in this case Orlando Ferrante) complaining about the lawyers saying what you could and could not do; and the Lawyer (Bob Foster, the guy who actually bought the land for WDW) complaining about the guys from WED who would design something, get Walt's approval and then dump all the legal problems on the lawyers. He mumbled something about the monorail and the Disneyland hotel and the guys from WED knew perfectly well that they couldn't span the city owned street with one beam, so they had to negotiate with the city, and phrases like "a center divider/planter maintained in perpetuity..."
Even more serious topics, like someone saying the best $17,000 ever spent (at least I remember $17G) was a suggesting by (I think) Charlie Ridgeway, for a satellite feed at Epcot's opening. Live broadcasts to millions every day on TV by your local affiliate, mostly for the entire opening week. Free publicity. They didn't have to advertise. The nightly news and daytime shows were advertising for them. You see these guys as talking heads on the Disney specials and as Disney experts and legends, but you never hear the little stories that people remember for some reason, the not so flattering side of Disney, the endearing side, and you certainly don't see them as people who knew and worked with Walt Disney. There was an autograph session after the afternoon break, and had Richard Sherman been one of the autographers, I would have spent the time in the lines, but he wasn't. So we bypassed the photo op. We have Dinner reservations at the Wave, and if we were actually paying attention to the time, we would have made it in time for our reservations. But we are 10 minutes late, and we are told we might have a 15 minute wait. We are, of course, given one of those buzzy lighty things. A couple minutes later, the Maitre'D comes up to us and says "Is the pager not working?" Nope, Jenny has struck again. I make a mental note that the buzzy lighty things are also called pagers. We split a pan-seared Sea Scallops appetizer, because it had bacon in it, and everything is better with bacon; I had the Whole Grain Penne Pasta with shrimp, mussels and clams, Jenny consumed the Oven-roasted Chicken with Savory Potato Waffles. End May 2011 Trip Report - Part 7.